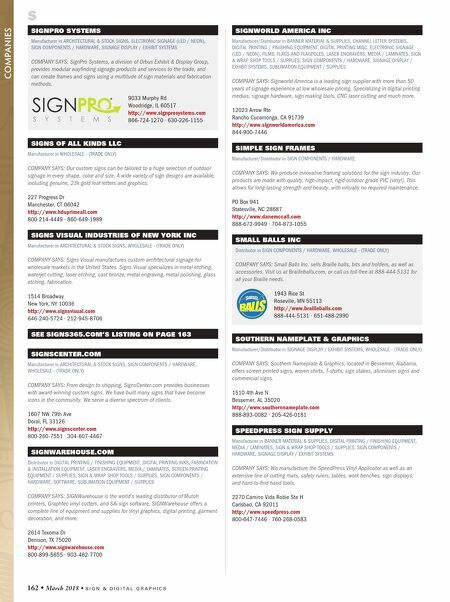 S I G N & D I G I T A L G R A P H I C S • March 2018 • 163 S SIGNS365.COM Distributor in BANNER MATERIAL & SUPPLIES, FILMS, MEDIA / LAMINATES COMPANY SAYS: Signs365.com offers phenomenal customer support and services. We offer 24 hour standard production time and overnight anywhere shipping. Visit our website for more details. 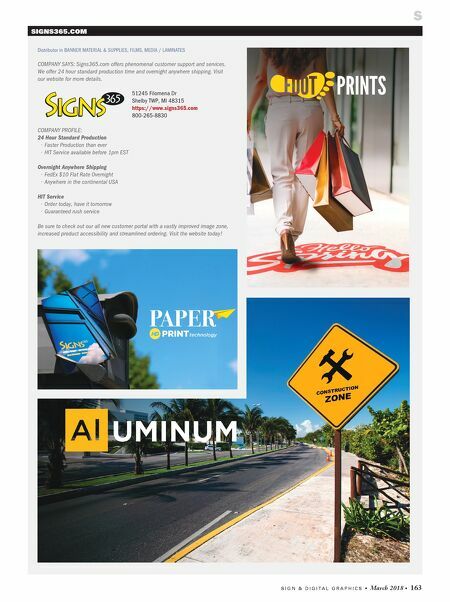 51245 Filomena Dr Shelby TWP, MI 48315 https://www.signs365.com 800-265-8830 COMPANY PROFILE: 24 Hour Standard Production • Faster Production than ever • HIT Service available before 1pm EST Overnight Anywhere Shipping • FedEx $10 Flat Rate Overnight • Anywhere in the continental USA HIT Service • Order today, have it tomorrow • Guaranteed rush service Be sure to check out our all new customer portal with a vastly improved image zone, increased product accessibility and streamlined ordering. Visit the website today!